Motivate yourself is a good way to keep positive attitude in all the game, even if you miss a point. Remember every point is a brand new start. So it’s not healthy to give up so early. A match come interested when you use what you know and you try to place the ball on the weakness point of your opponent. Vamsi, you leave early and you forgot to play one more match. Hopefully you don’t forgot our golden rule of at least 3 matches by tournament. We want to welcome also the new players! The match was very competitive and any of them could have won. But what make table tennis interested? Play against your friends in the club, challenge them and all the time give your best. But also at the same time because they are your friends doesn’t mean we have to be unrespectful, my grandma use to say “more time you know your friend, you must be more respectful with him/her”. 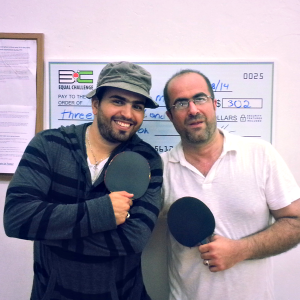 Table tennis is also a sport for gentlemen and here in Newport Beach we promote this. Congratulations Hammed! Can Hammed win the Equal Challenge Tournament 2 times in row this week? Did you know Newport Beach Table Tennis Club has a jackpot of $302 for any table tennis player who win 4 weeks in a row the Equal Challenge Tournament?